I am often reluctant to try new whole-wheat or whole-grain pancake recipes because for some reason the multiple ones I've tried don't turn out very well. Have you ever had that problem? Luckily, this morning we had a breakthrough and I finally found a recipe that we really like. The little miss even agrees saying they are her favorite pancakes and let me tell you what, that means a lot coming from a toddler who usually plays frisbee with the other so called 'healthy' whole-wheat pancakes I've made. 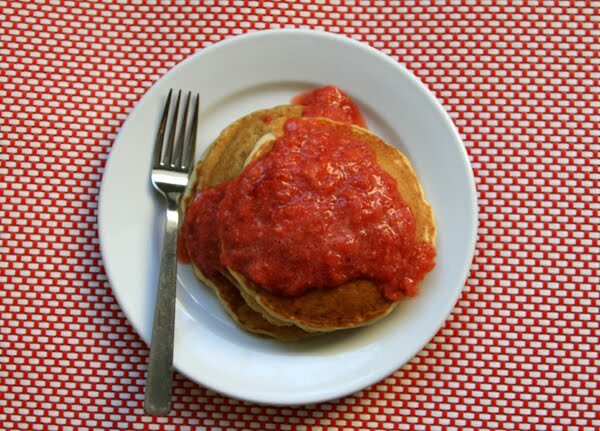 If you are looking for a nutritious pancake recipe, give this one by Ellie Krieger a shot and oh my ... the Strawberry Sauce really makes them extra good. (ps. *I used whole-wheat pastry flour instead of whole-wheat flour and fresh strawberries for the sauce). I haven't made pancakes in years, but that Strawberry Sauce looks so good - I want to make them right now. Thank you for the 'heads up' on this. We have also tried MANY and had varying degrees of success. I will definitely try these.